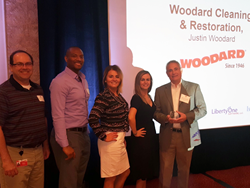 A team from Woodard attended the Future50 Awards luncheon to accept the award on Woodard's behalf. We do all we can to help people, and it’s great to be recognized for our strength in the market while doing what we love. Woodard Cleaning & Restoration has been honored by the St. Louis Small Business Monthly (SBM) as one of the 50 Fastest-Growing Companies in St. Louis. The award, known as Future50, honors the achievements and accomplishments of the thousands of small companies throughout the St. Louis metropolitan area. Winners were honored at a luncheon August 16 at the Hilton Frontenac Hotel. St. Louis Small Business Monthly is St. Louis’ locally-owned business publication, bringing business tips, strategies, and analysis to the presidents, CEOs, owners, and top executives of 25,000 businesses in the St. Louis Metropolitan region. SBM, founded in 1988, publishes every month and also provides information via the Internet at http://www.SBMon.com and through a variety of business-related forums.